If you let your guard down, they pounce on you. They get under your silverware or in between your muffin and your plate; they get tucked into the bag that you specifically asked not to have; they come wrapped around your icecream cone. I’m taking about paper napkins. We’ve been doing our best to avoid this ubiquitous dining accessory, but to no avail. True, they are compostable, and we at the Clean Bin have been reluctantly pocketing the ones we get stuck with and shredding them with the veggie peels, but it’s so unneccessary, and I don’t really want the bleach and chemicals that make that napkin so snowy white leaching into my garden long-term. Straws, on the other hand, are handy. How else should you drink while laying in a hammock? Or while sick in bed? 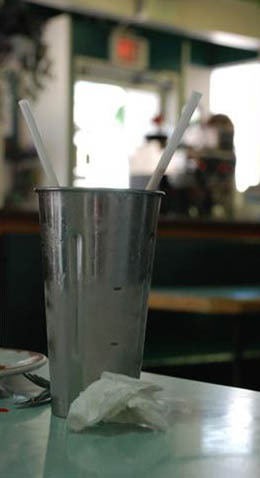 Have you tried a milkshake without one? Not the same. Have you tried to keep one and clean it out week after week? Doesn’t last long does it? The plastic straw was simply designed to be disposable. And that’s the problem with it. I don’t pick up many straws, but we did accidentally get a couple in the aforementioned milkshake this week, and it felt terribly wasteful. Part of the impetus behind the “excessive packaging clause” is the thought that lots of packaging is temporary. I don’t need a bag for the bread I’m going to eat this evening, I don’t need a napkin for a muffin I’m going to eat in 2 minutes, and I don’t need a straw for a drink that I’m going to drink in 30 seconds. Of course, it’s all trivial. But disposable this, disposable that – it all leads to housecleaning with a swiffer and having boil in a bag beans for dinner. Pretty soon you’re lugging two cans of garbage out to the curb every week. So here’s all of us trying to do the little things by foregoing straws and carrying cloth napkins. It’s gets you everywhere doesn’t it? I love how you notice these things, that perhaps, a few years ago, you would have paid no thought to. Well done and, as you say, at least the napkins are compostable. I’m not sure what to say about the straws; I guess we just need to learn to say NO more! I realise that this is a very old post, but I just wanted to mention that non-disposable straws are available. They tend to be novelty, and have funny twists and turns, but they’re made of stiff plastic, and intended to be kept. They also have stainless steel straws that I have seen on amazon if you are interested in reducing plastic.